Jon Ossoff’s loss to Karen Handel in Georgia’s 6th District is a painful one for Democrats. Democrats’ positive spin doesn’t make their loss in Georgia less painful. 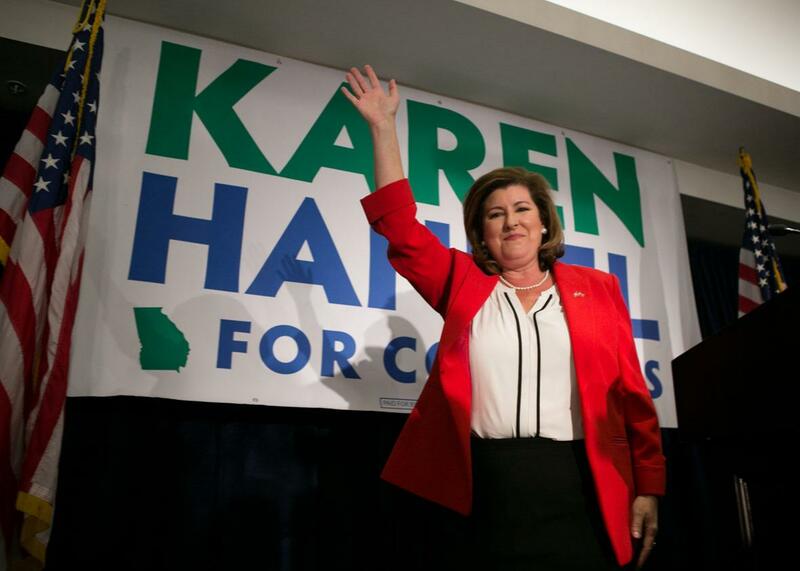 Georgia’s 6th Congressional District Republican candidate Karen Handel gives a victory speech to supporters gathered at the Hyatt Regency on Tuesday in Atlanta. Some liberals are putting an optimistic spin on things: It’s a good sign for Dems, they argue, that Ossoff got as close as he did to victory in a district that hasn’t voted blue since Jimmy Carter was president. This isn’t wrong, but it doesn’t make the loss less painful. An Ossoff victory might have scared Republicans into siding with the majority of Americans who disapprove of the disgusting man occupying the White House. It might have spooked some of them out of passing a bill to gut health insurance for tens of millions of Americans. It would have made it clear that as nightmarish as the Trump presidency has been, as much as every day since Trump’s inauguration has been poisoned by his presence, help is on the way in the midterms. I’m reading a lot of complaints about the Ossoff campaign this morning. Some people, including some of Ossoff’s own volunteers, say he should have hit Trump harder. Others say his loss proves that an anti-Trump message is not enough. Maybe another candidate or another strategy could have won, but I remain impressed by Ossoff, a 30-year-old first-time candidate who took everything the Republican Party could throw at him without losing his composure, and whose decent and hopeful campaign inspired thousands of volunteers to work their hearts out. If there’s any reason for optimism, it’s those volunteers, who assured me again and again that, whatever happened on Election Day, they’re not going anywhere. A refrain I heard several times was, “We’re just practicing for the midterms.” If liberal funders were smart, they’d put money into some of the grass-roots groups that have sprung up in the 6th District to make sure they don’t wither in wake of Ossoff’s defeat. Earlier, I wrote about Jessica Zeigler, a working mother of three who started a program to train recent high school graduates to mobilize their social networks for voter outreach. Someone should be paying her to do this full-time in every congressional district in Georgia. Zeigler is devastated, but she texted me, “Friends are already organizing data-based feedback forms and strategy meetings. So we are resilient.” Let’s hope the country is, too.